Starts with the gathering of engines at Drusillas; the road run from Drusillas to the show; the most impressive opening ceremony ever; the christening of an engine. In the Heavy Haulage Arena there is now a continuous hive of activity and at times 40 or 50 engines, Scammells, rollers etc can be seen together. Eric tries to cover us in dust. 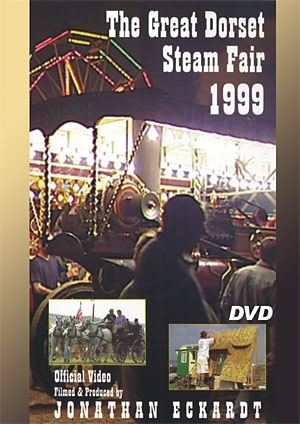 There is a very interesting clip of the Wall of Death and the Red Indian motorbike; two bus loads of robed french dignitaries overwhelmed by noise and spectacle; the Anderton & Rowland Marenghi Grand Organ; some fine decorated harness in the horse section; "Charlie" in Horticulture; a Dutchman with a steam driven generator; Adrian Smith's unique "Eagle" tractor; farmer Snowden showing the old skills of countryfolk; John Uphill blowing the "Mauretania" ship's steam sirens with the aid of two ploughing engines; the debue of the Leach & Overington Concertorgan - the largest built in England (and by enthusiasts ! ); another appearance of Heavy Haulage among the crowds of Saturday night and Michael Oliver crowned "King of the Showmen" by the Passion Dancers. It had been intended as a breather before the enormous efforts that lay ahead for "2000", but perfect weather, vast crowds of visitors and the infectious high spirits of the exhibitors turned this into the best rally so far. The Wall of Death and the Red Indian motorbike. The Anderton & Rowland Marenghi Grand Organ. Some fine decorated harness in the horse section. Adrian Smith's unique "Eagle" tractor. Farmer Snowden demonstrating the old skills of country folk. John Uphill blowing the "Mauritania" ship's steam sirens with the aid of two ploughing engines. The debut of the Leach & Overington Concert organ. Michael Oliver crowned "King of The Showmen"
And not one drop of rain!